Object storage supplier Cloudian is buying Italian firm Infinity Storage to add file access and cloud storage gateway functionality to its services. CEO Caterina Falchi started Milan-based Infinity Storage in 1998 and wrote one of the very first software handlers for WORM optical jukebox storage, a network jukebox controller. 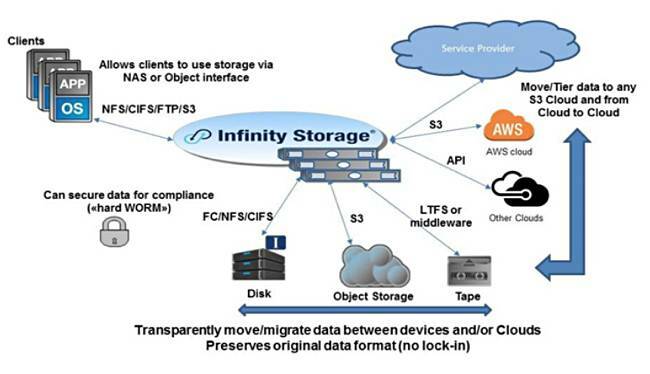 Infinity Storage built on Falchi's earlier optical jukebox work to develop software-defined storage that could handle multiple front-end protocols and use multiple backed media types to store data. The software is mature and Infinity has worked on customer deals with NetApp and Cleversafe, before IBM bought the latter. When Cloudian was selected by HPE's EMEA organisation for certain object storage customers in 2017, it was introduced to Infinity Storage, which had already linked arms with HPE on a deal in the global automotive sector. In summer 2017, Infinity Storage and Cloudian started work on HyperFile. The Cloudian-HPE EMEA deal was announced in November 2017. HyperFile was announced in December 2017. Now Cloudian has bought Infinity Storage, and we wouldn't be surprised if this story still had a chapter or two to be added. How will a Silicon Valley, VC-funded object storage company fit with an Italian software code shop that has never had a sales team? Michael Tso, Cloudian CEO, said Falchi's company has the same technology production nous as Cloudian: "We looked at all file gateways. All lacked the kernel development skill and the converged access [of Infinity Storage]." Both companies allow potential customers to download free software, and they share a view that object storage will end up holding 80 per cent of the world's data. Falchi said: "Cloudian can invest money in growing the Italian branch of Cloudian ... Now we can sell all over the world." In 2015, some 25 per cent of Cloudian's sales came through the channel. In 2016, it was 36 per cent, and in 2017 this figure went up to 70 per cent. Infinity's wares will also be sold by middlemen. Other object storage vendors will now find they are facing a stronger competitor, one with both a mature file storage and cloud storage gateway, plus WORM capabilities. The Cloudian-Infinity Storage integration is expected - by management at least - to be swift as there is no Infinity Storage sales, marketing and channel organisation to integrate with Cloudian's, and the two back office organisations should be relatively trivial to bring together. Similarly there will be no need to combine offices or have layoffs to gain operating efficiencies.